I think all of you will answer "yes". Then, do you ever go to Bali? I think almost of you answer "Yes, off course" and some of you who do not yet visit Bali will answer "Someday I will visit Bali". I, Myself, already visited Bali three times and I still interest to visit Bali again someday. 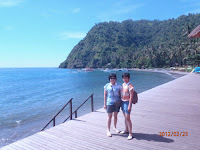 In this article, I want to share my third trip to Bali in March 2012. In this trip, I choose places that I haven't visited yet, except sunset Kuta Bali that always schedule in my itinerary. I went from Jakarta to Bali by Airasia. I got very very cheap promo ticket, Rp 500 thousand for three tickets round trip. Thank you Airasia! First day in Bali, I enjoyed sunset in Kuta Bali. The Kuta beach in the back of Bali Dynasty (hotel that I stayed along this trip) is not crowded and the beach is quite clean so that I enjoyed sunset there. Waiting the sunset, I walked along the road beside the beach from the back of Bali Dynasty Hotel to Mall Discovery. When the sunset comes, immediately, I took some pictures. In the second day, I also took some sunset picture but the sunset colors of these two days sunset were different. The first day sunset colors were combination of yellow to brown color and the second day sunset colors were combination of purple to dark blue color. Why do they different? Because the second day afternoon was raining then the sunset color become combination of purple to dark blue color. 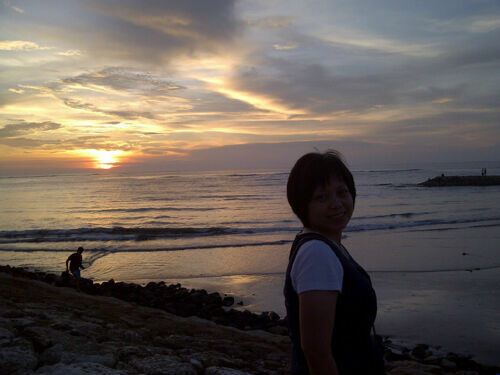 Beside Kuta Beach, we also can enjoy sunset at Jimbaran, Tanah Lot, GWK, Dreamland. 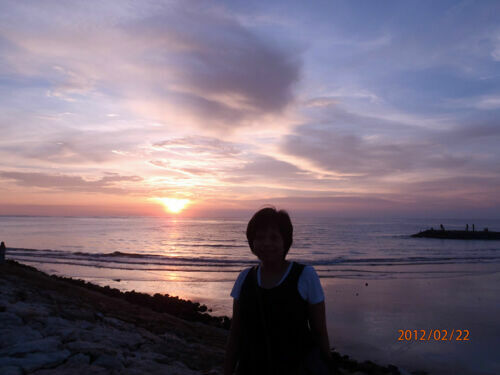 In my second trip to Bali, I also enjoyed sunset at Tanah Lot. Second day trip, I tried submarine. In Bali, there is a submarine that is used for tourism. It solved my problem because I want to look the view of sea bed but if I take diving or snorkeling, I have trouble with my contact lenses and I also need to add my brave. When I went into the submarine after a five minute boat ride, I was surprised because in the bottom of the sea was so bright! The sun also shines unto the bottom of the sea! Before, I thought that in the bottom of the sea as darker. The submarine went down to 35 meters under the sea. We can saw coral reefs, but we had not yet saw fishes. Where were they? Some minutes later, many fishes came to the window.... Very brave fish that was not afraid with big submarine, I think,... but my thinking was wrong, they followed a diver who arranged them to go near the submarine by giving them food. Yeah, yeah...., naturally fishes will avoid the big submarine therefore they used this way so that all of us inside submarine can see fishes. The journey was not long, only around thirty minutes, but this trip gave me one wonderful experience and cut off my opinion that under the sea is dark although at noon. Third day - Bali Safari, I saw some shows that present by animals. There are funny and clever. My sister had a dream to take picture with white tiger. But, her dream cannot come true. The white tiger is big now, therefore visitor cannot take picture with him anymore. We only take white tiger picture behind the glass. The white tiger is so funny because he is pacing back and forth while there are visitors behind the glass. I think that the white tiger still happy if people take his picture, same when the white tiger still a baby tiger. 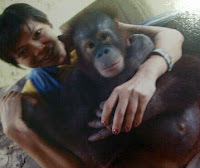 To fulfill my sister hope to take picture with animal in Bali Safari, she took picture with a baby orang utan. I have one comment to this baby orang utan "this baby orang utan make a big contribute to the safari income". We need to pay Rp 50 thousand to take picture with this orang utan and many visitors took picture with this orang utan. Then, I think "Do I already give a big contribute to my company where I work? Do I already give value for my family, my nation, my God?"... Ho..ho..ho..I hope I do and need to be maintained. I do not want to lose. After I saw animals in Bali Safari, I saw Bali Agung Show. It is located inside Bali Safari. The show held on Tuesday to Sunday, 2.30-3.30 pm. For me, the stage and the light setting is cool! No less compare with Lady boy show at Pattaya. The show story is inspired by the historic and legendary 12th century accounts of King Sri Jaya Pangus and his beloved wife Kang Ching Wie. This is the end of my third Bali trip story. Even I already when to Bali three times, I still have to dream go there, I hope next time I can enjoy yoga in Bali.